Our theme this week was the Earth, Earthquakes and Rocks. We had so many ideas that I have separated them into two posts. This one covers Earth and Earthquakes, the other focuses on Rocks. 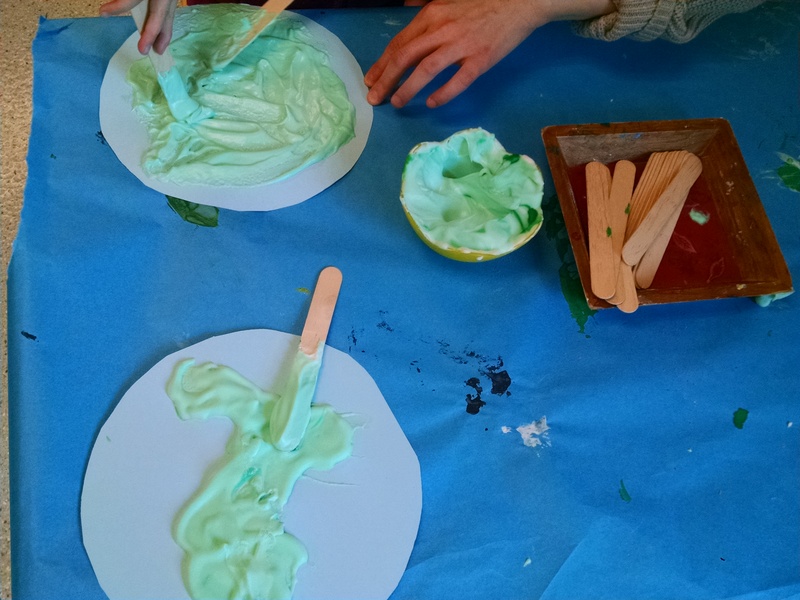 As always, we began class with Discovery Time, where we let kids explore all our activities hands-on (activities are described later in this post), before we talk to them about the day’s concept or the scientific theories we’ll be discussing. This raises their curiosity, allows for a-ha moments of independent learning, and raises questions which helps them engage more with the answers we give. Then we have opening circle, then tinkering time to explore more. 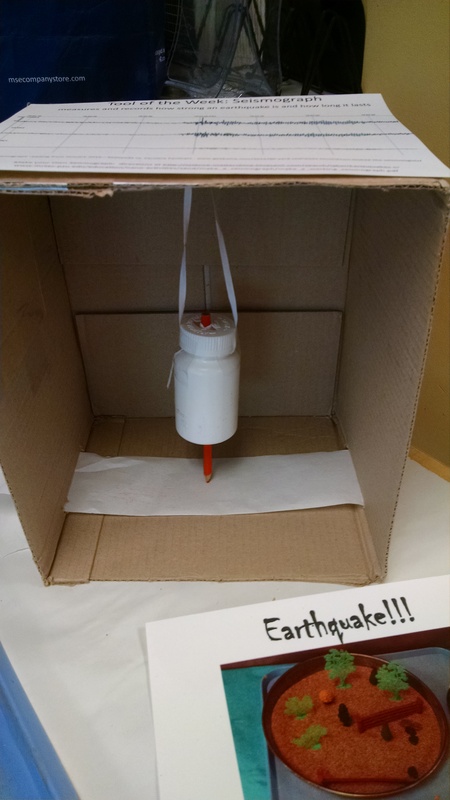 Shake Tables: I built shake tables (earthquake simulators). 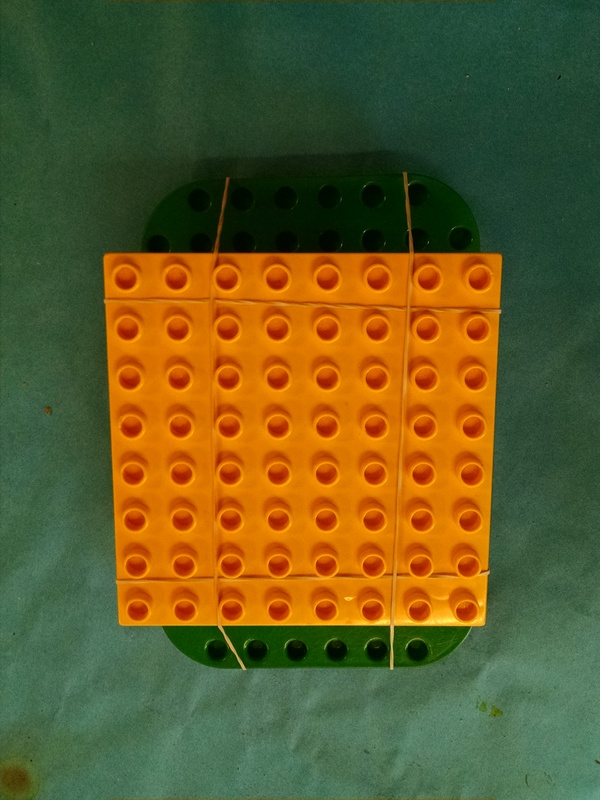 What the pictures below show: For the first, I took two duplo base plates (green and yellow) and rubber-banded together, back to back. Then inserted four rubber bouncy balls in between them, one at each corner. For the second, I cut the cover off an old three ring binder to get two stiff “boards.” Then I placed two dowels between them for them to roll back and forth on, then rubber banded that together, and taped a Duplo base board to it. 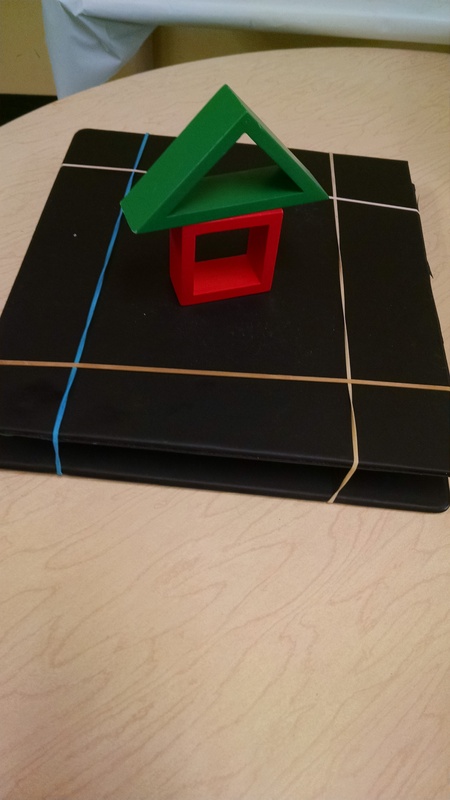 The third one was the binder covers, rubber bands, and balls, but no Duplo base board. On each of these shake tables, if you bump a corner or pull back then let go of one side, it would jiggle and shake. We also had a wobbly lazy Susan in our cabinet and it was a great earthquake simulator. We had Duplos out, so they could build Duplo towers. If they built a very tall tower, the “earthquake” would knock it down. Unfortunately, Duplos are pretty sturdy (especially when you attach them to the base plate! ), and it was easy to build towers that could withstand the shake. The wooden blocks were a more effective demo. 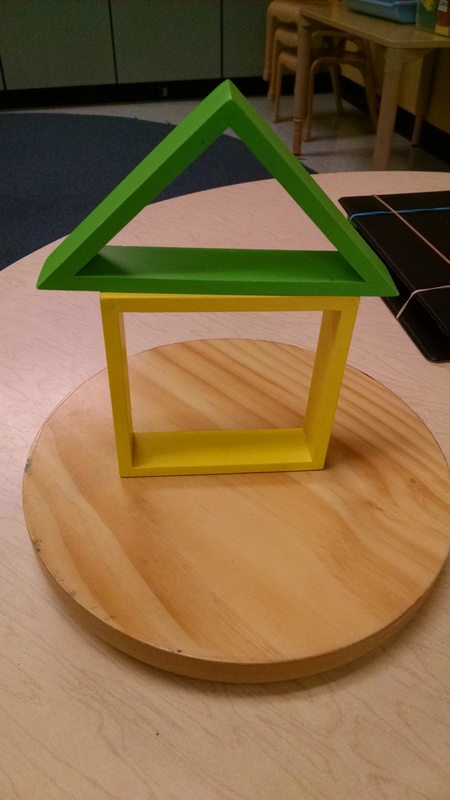 For our little kids (age 3 – 5), we just had them build with the wood and knock it down. 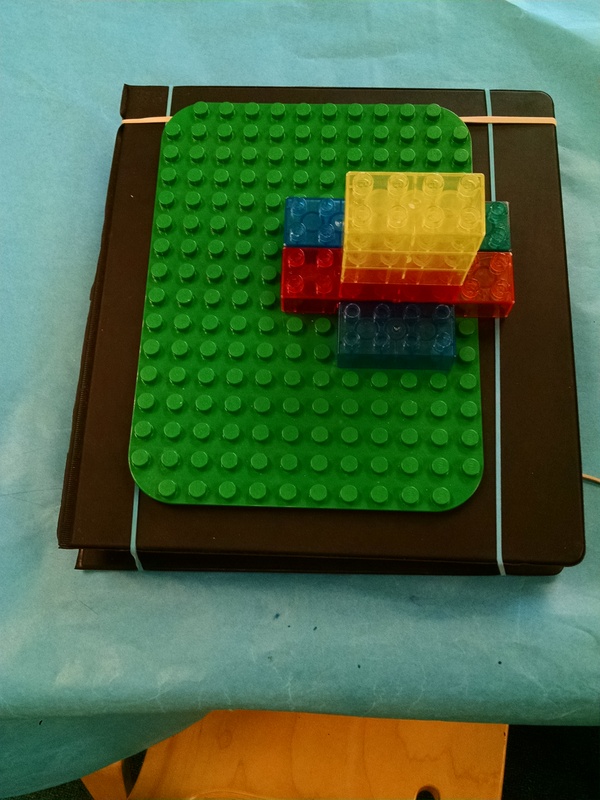 We had our oldest kids (age 6 – 7) try building with Duplos too to see the difference that materials make in earthquake safety. In the IMAX movie “Dream Big – Engineering Our World”, they showed a class project where they set large jello molds on top of the shake table and jiggled them. 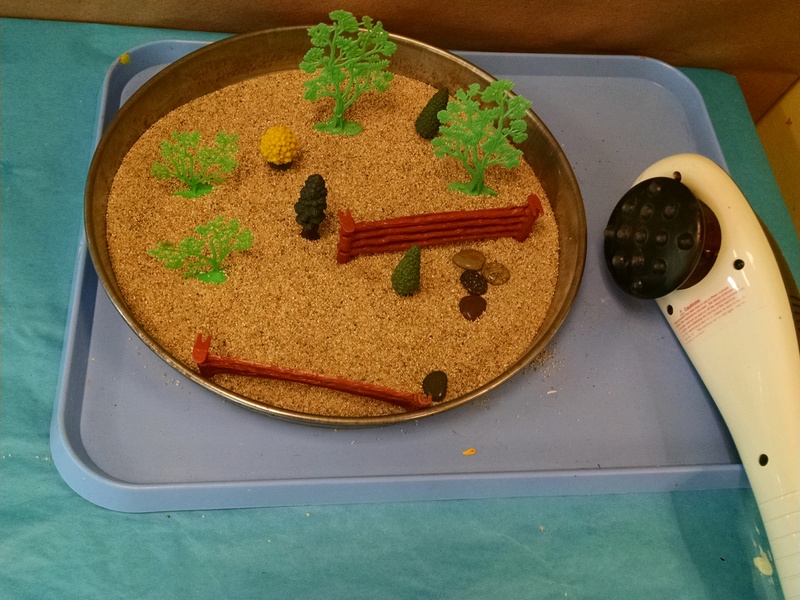 Earthquake on Sand: Last year, we filled a large pan with sand, then placed nearby plastic fences and trees and some flat rocks. We also put a back massager tool next to it that could be used to create a vibration. If you held the back massager to the side of the pan, the sand would start to jiggle, then shift and move, knocking over the trees and fences, carrying the rocks across the pan – flowing almost like water. Clear evidence for why not to build on loose soil in an earthquake zone! With the pan, you had to hold the massager just right to get a response, and we worried about a big spill. 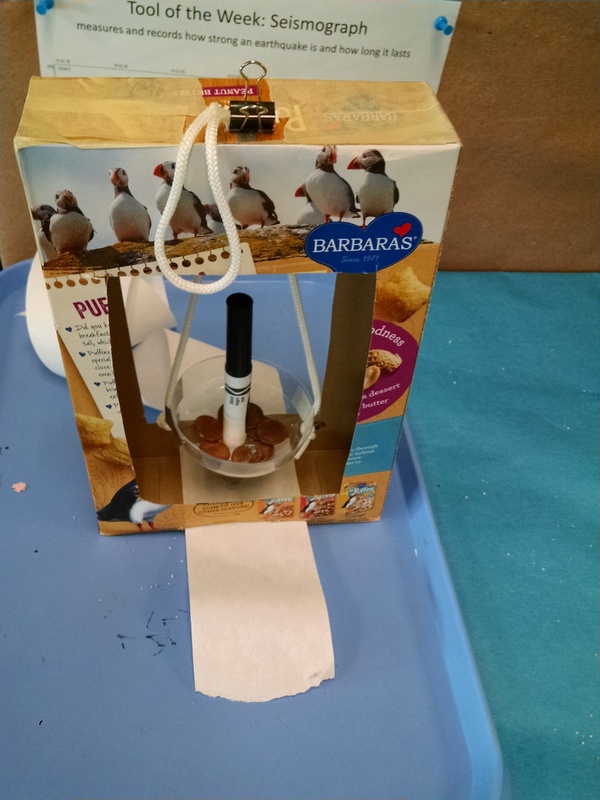 This year, we used a big plastic tub that was half full of sand and other sensory materials. The tall edge was much easier to place the massager on, so worked better for our little ones. If you try this experiment, definitely try a variety of containers to find the best effect! Note: building the seismograph is a lot of work, and so far I haven’t got one to work well enough to really engage the kids, but I want to play with it more, because I think they could really love seeing the difference between little shocks that create squiggly lines and big shocks that really jerk the pen back and forth. Plus, it’s good for me to challenge myself just like we try to challenge the kids to take a design, test it, improve it, test it again, and improve it again. Understanding Earth’s Layers. 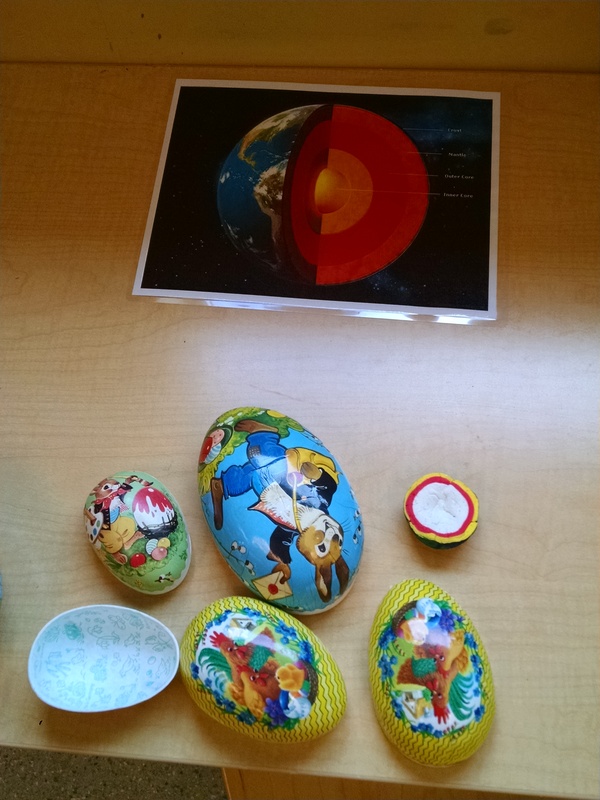 We put out 4 ways to illustrate earth’s layers – an illustration, nesting easter eggs, a model of the earth, and a puzzle of nesting rings. The model was made with Model Magic – on Monday, I made a ball of white clay for the inner core and let it dry overnight. On Tuesday, I covered that with a layer of red for the outer core – you’ll see that my proportions are off – I need less white or more red. On Wednesday I added the yellow “mantle” and let it dry. On Thursday, I painted it – the paint layer is the Earth’s crust. On Friday, I very carefully cut it in half with a bread knife. Understanding Tectonic Plates – a jigsaw puzzle. This is easy – just find an illustration online of a world map with the plates shown. Print it, laminate it, cut it along the fault lines. 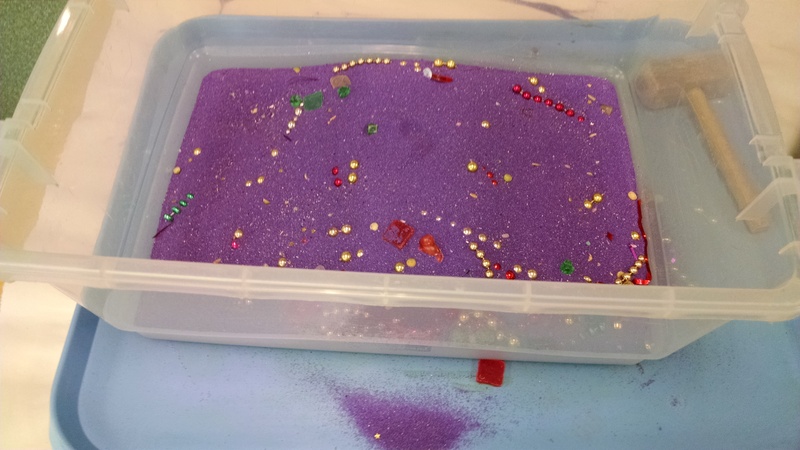 Make a Tsunami Wave – we filled the water table with water and some glitter. We made sailboats like we did for Wind week. 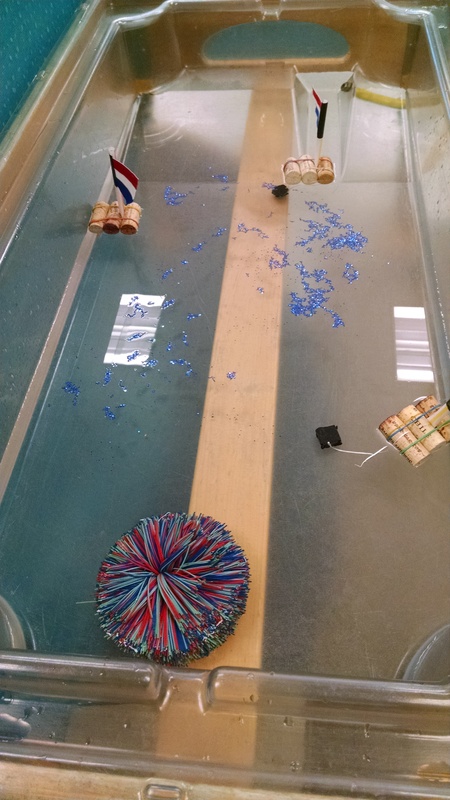 We added anchors to two of the boats – we wrapped up pennies in electrical tape, and tied them to the boat with string. You can create a wave by simultaneously lifting and pushing one end of the table. (The kids can also drop the koosh ball to make waves, of can just splash in the water.) There is more you can do with this idea… just go to YouTube and search for tsunami science fair. 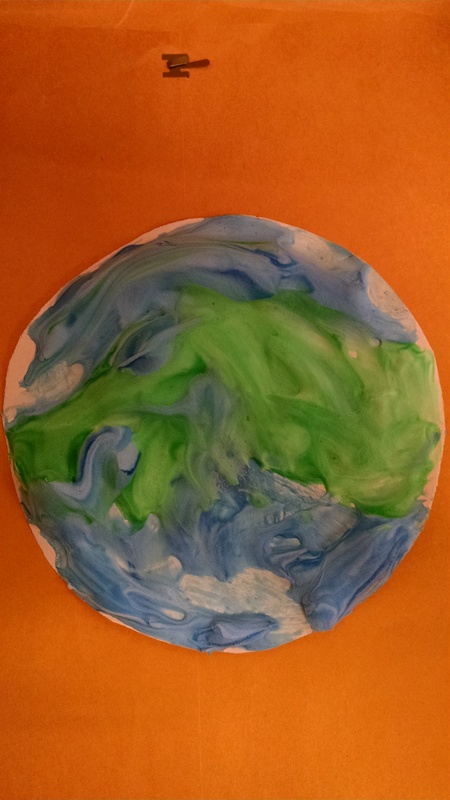 Puffy Paint Earth: We mixed shaving cream, Elmer’s glue, and liquid watercolor to make puffy paint to paint on to blue cardstock circles. (Later in the day, we switched to using big easel paper, and drawing a big circle in the center for them to paint – this was easier than trying to keep all the pain on the circle.) We had a photo of the Earth posted next to the table for inspiration. You could do more with this by having cotton balls to pull apart to make clouds, and pebbles to build mountain ranges on your continents. 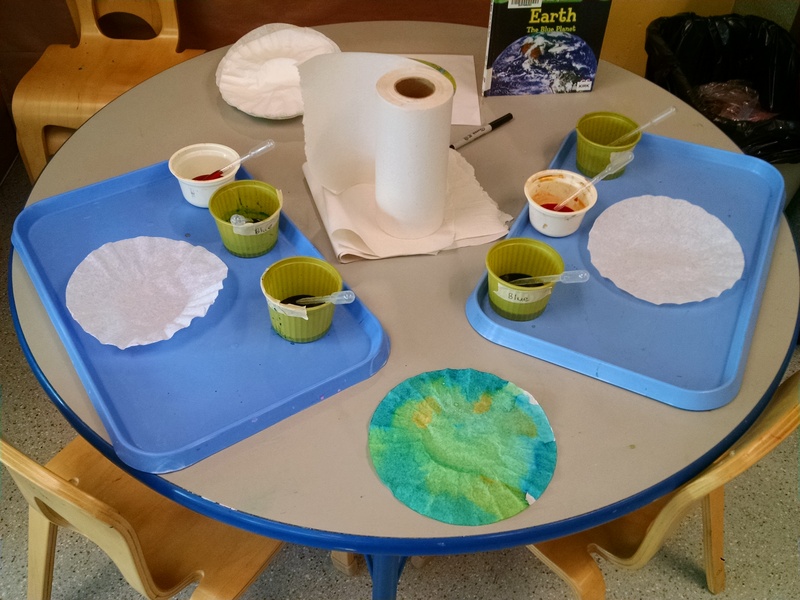 Coffee Filter Earths: Last year, we put out coffee filters, liquid watercolors and pipettes, plus pictures of the Earth for inspiration. Kids could drip on watercolors. With little ones, they tend to use a LOT of watercolor when working with pipettes, and soak the trays, so after they finish with a coffee filter, you need to use paper towels to mop up their extra color. You could reduce this issue by using eye droppers with a slow flow rather than pipettes. If it’s warm out, you can hang coffee filters on a string, and let kids spray them with spray bottles of diluted colors. Craft: Terrarium We made a terrarium, where we used layers of sand, rock, charcoal and dirt, and talked about how this is similar to how Earth is made of layers. These are described in detail in my post about rocks. Snack – Layers. You can either do a yogurt parfait where kids layer together yogurt, fruit and granola, or a mud cup where they layer together chocolate pudding, bananas, crumbled graham crackers, and a gummy worm. Today’s question / Big Picture Ideas: What causes an earthquake? Earth is the planet that we live on. 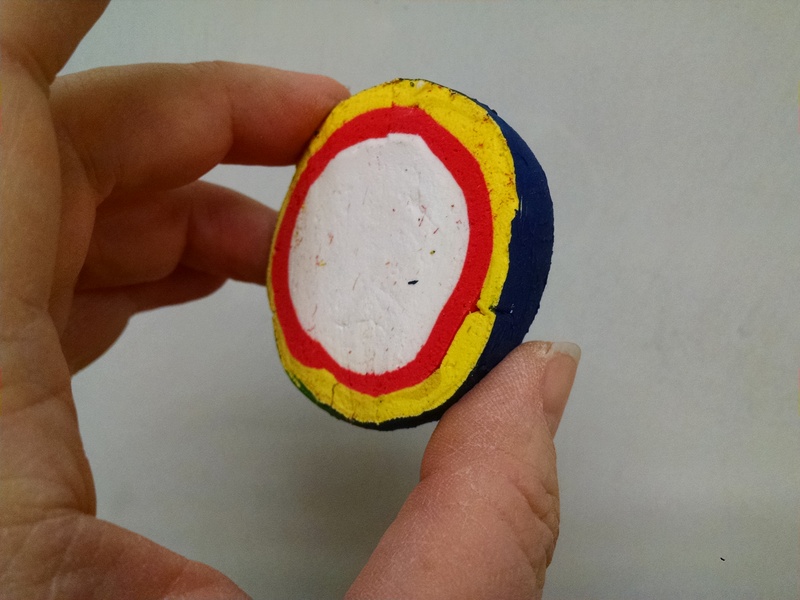 It’s shaped like a ball, but the ball is made up of many layers. We live on the top layer, the crust. The crust is made of several big plates that fit together like a puzzle. When those plates bump up against each other, or rub against each other, they cause earthquakes. Little earthquakes happen all the time, and mostly don’t cause damage. But, a big earthquake can knock over trees and buildings, so we do need to know what to do to stay safe if we feel an earthquake. When reading through the book, you can incorporate hands-on visual aids. There was a picture of a globe, and if you have one, you could pause a moment there to explain what a globe is. 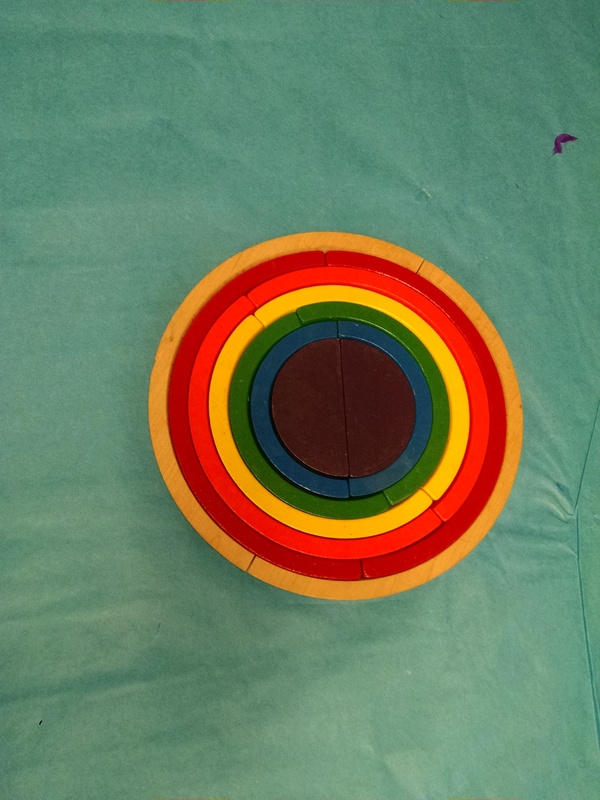 When it discussed the layers of the Earth, we showed our model magic sphere – we could have also used the rainbow puzzle (see above). We then passed around the sphere for them to touch. We also talked about our terrarium project, where we put rocks down in layers. 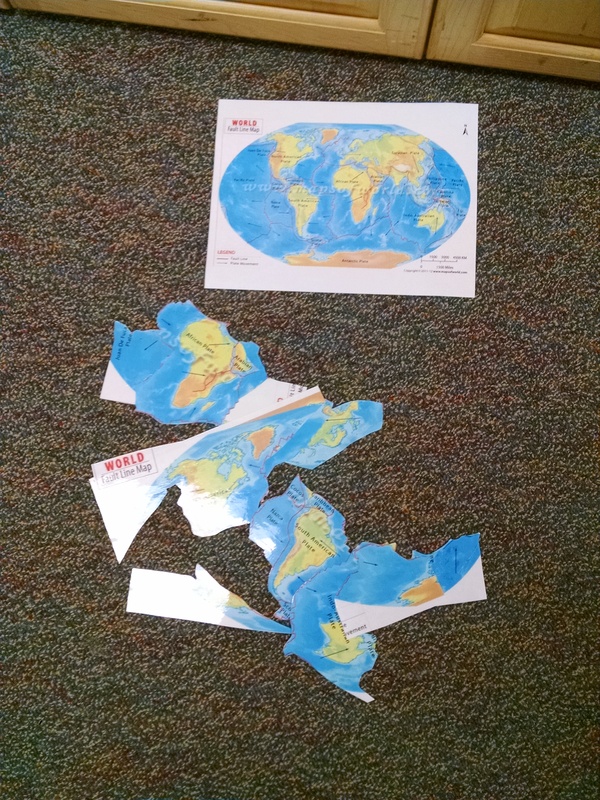 When the book talked about how the crust is broken into pieces that fit together like a jigsaw puzzle, we showed our tectonic plate jigsaw (see above). When it talked about plates bumping up against each other, we demo’ed that with tumbling mats. (You could also demo it with crackers, as described on Mad Sci Network. There’s a more complicated graham cracker demo on Homeschool Den.) The book also showed a picture of a seismograph, so we reminded them to check out our DIY seismograph in the other room. Tumbling Mat Demo of Tectonic Plates: We had set up the mats on the floor in advance for the kids to sit on during circle. 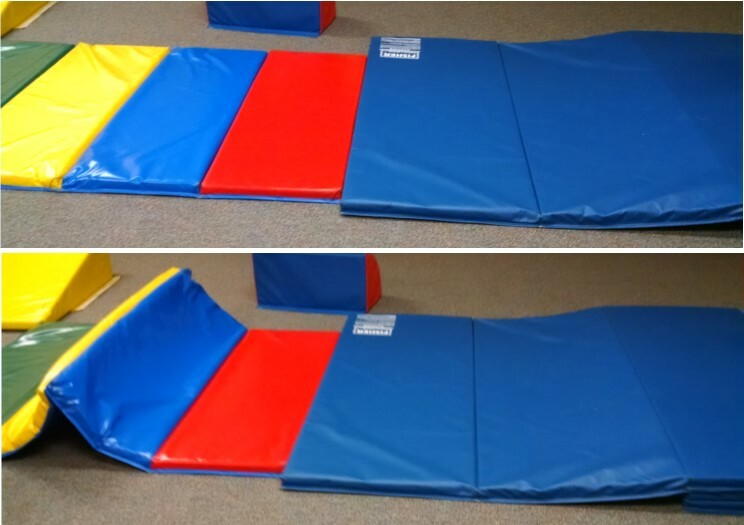 At this time, we had them get off the mats, and told them to imagine that the blue mat and the rainbow mat were two tectonic plates bumping up against each other… we pushed each one toward the other… The rainbow mat buckled up to relieve the pressure – creating a mountain! Sometimes the rainbow mat will slip and land on top, with the blue mat going under, which can also happen in earthquakes. Earthquake Drill: We talked about how today we’re playing with the idea of earthquakes, and having fun knocking over Duplo houses and plastic trees with fake earthquakes. But, we said, real earthquakes can be scary when they happen and can be dangerous, and you need to know what to do. We explained that when the ground shakes it can knock you over, and also things can fall on you, and you could get hurt. So, if the ground starts shaking, you need to drop, cover and hold on. We practiced doing this together during circle (in a room with no tables) and then practiced again later in the day while the kids were in a room with tables. I have a post where I discuss all the details of the current recommendations on earthquake safety (note: if you’re still teaching to hide in a doorway, or to move across the room to an interior wall, then you’re not following current recommendations.) 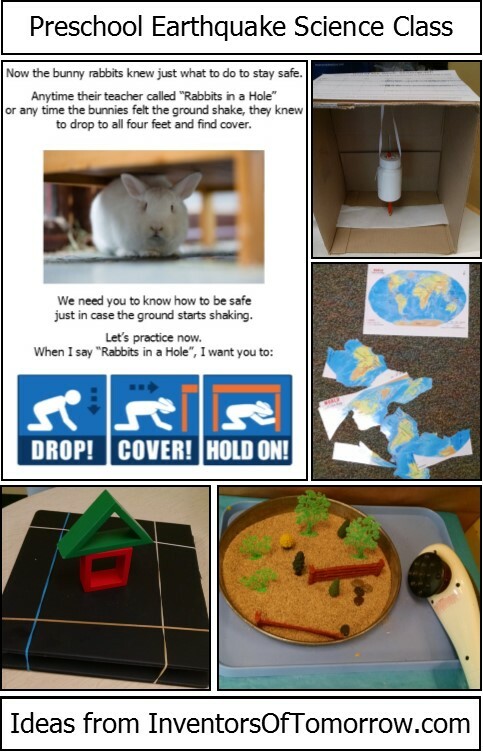 That post also includes a book that you can download to read to your child(ren) and use when practicing earthquake drills – it’s called “Rabbits in a Hole”. Click here: for all the information about earthquake preparedness for preschool. Book: You could read Round Like a Ball , a nice book about the Earth, or Roslyn Rutabaga and the Biggest Hole on Earth! by Gay – a silly little book about digging a hole to the center of the earth. Slinky Waves: You can use a slinky to illustrate two kinds of earthquake waves. For a p-wave, you stretch it out, then give a quick push-pull on one end – the wave travels to the other end and back again. For an s-wave, you swing it side to side – this works better if the slinky is laid on a table or on the ground than if it’s held in the air. Here’s two detailed discussions of this activity: http://web.ics.purdue.edu/~braile/edumod/slinky/slinky.htm and http://earthquake.usgs.gov/learn/kids/RockShakeyGround.pdf (Note: this second link is also just a great overall resource about earthquakes. Earthquakes by Schuh. I strongly prefer Bauer, because Schuh has several photos of collapsed buildings and bridges which might be concerning to some children. The tone of the words is reasonably reassuring. Pandas’ Earthquake Escape by Perry is about a mama panda and her babies escaping an earthquake. The nice thing is that it’s an engaging story about a mother and her children (the kids really enjoyed listening to it), but I think it’s a bit long for circle, and it also shows animals running away in an earthquake to try to find safety, when we’ve just taught that the best thing is to drop, cover and hold. So, I cannot recommend this book. Round Like a Ball by Ernst. “Let’s play a guessing game! I’m thinking of something that is… round like a ball. ‘I love balls’ barked the dog.” Nice illustrations and graphic design elements. Appealing and engaging read-aloud. Our Earth by Rockwell. A nice simple book about the Earth. Appealing to animal lovers, as there are animals pictured on almost every page. Earth by Taylor-Butler, Earth by Roumanis, and Earth by Bloom are all early-reader non-fiction books that are part of series that cover each of the planets of the solar system. I like Roumanis best, because it has a section at the back for parents/teachers that gives more detail about the basic facts on each page. All these books are fine, none are great.